1) The contract must be completed within 30 days of reservation. 2) If the buyer pay via a financial instruction the buyer shall pay any bank administration fee. 3) The buyer shall pay for water and electricity meters installation. 4) The buyer shall pay for the land office transfer fee. 5) Corner plots have the premium charge of 100,000 baht extra. 6) Plots in the 6 village - from 256 sqm. Additional land is priced at 23,000 baht for 1 SQW (4 sqm), pool 1 sqm - 18,500 baht. 7) Community maintenance tee is 20 bath/sq.w/month. Payable 2 years in advance. 8) The price published and promotions offered may change with prior notice. 6) Additional land is priced at 25,000 baht for 1 SQW (4 sqm), pool 1 sqm - 18,500 baht. 7) Community maintenance tee is 15 bath/sq.w/month. Payable 2 years in advance. 1) The contract must be completed within 15 days of reservation. 6) Additional land is priced at 23,000 baht for 1 SQW (4 sqm), pool 1 sqm - 18,500 baht. 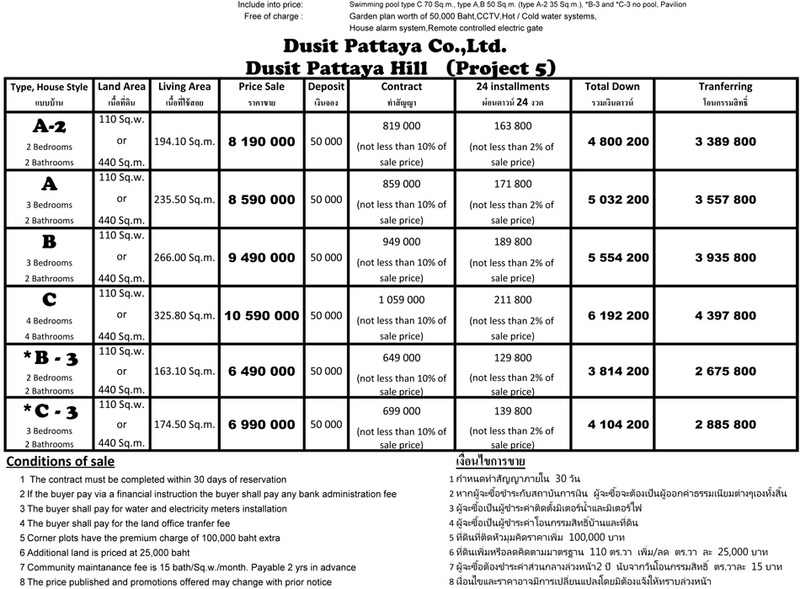 6) Additional land is priced at 20,000 baht for 1 SQW (4 sqm). 7) Community maintenance tee is 30 bath/sq.w/month. Payable 2 years in advance. Prices and terms of payment may be changed without prior notice.